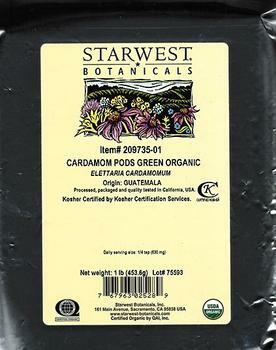 Starwest Botanicals is recalling Starwest Botanicals Organic Cardamom Pods Green (Whole). Starwest Botanicals Organic Cardamom Pods Green (Whole) 1-lb. with UPC 7-6796302528-9. The item# 209735-01 and lot number (75593) can be found on the label affixed to the bag. Starwest Botanicals Organic Cardamom Pods Green (Whole) bulk pack with UPC 7-6796302527-2. The item# 209735-00 and lot number (90186-00) can be found on the label affixed to the bulk pack. The recalled product was sold between January 15, 2018, and March 2, 2018, and was either shipped directly to Starwest Botanicals customers who purchased online from firm’s website or mail order customers, or held for pickup up by the customer at Starwest Botanicals. Customers who purchased the recalled product may return it to Starwest Botanicals in Sacramento, Calif., for a full refund. Consumers with questions may contact Starwest at 1-800-800-4372 Monday through Friday 8:00 am – 4:30 pm (PST).